At the end of the 2012 documentary "Ai Weiwei: Never Sorry," the iconoclastic Chinese artist and political activist has just come home after the government held him for 81 days in solitary detention. The usually impish, expansive Ai politely rebuffs the reporters and photographers who have gathered outside his house seeking comment. He is on probation and under orders not to speak to the media. "Live your life," Ai says with resignation before closing the front door. "Everybody should live your life." The new documentary "Ai Weiwei: The Fake Case" picks up right from that moment and shows how Ai attempts to live his life—and yet still share his voice—while under house arrest and constant monitoring. Whereas Alison Klayman’s first film provided a broad perspective of Ai’s work and influence, Danish director Andreas Johnsen offers a more specific snapshot. It is a lower-key film by nature because Ai himself is lower-key this time. But then the fire in his belly begins to grow anew, and watching him regain his confidence, sense of self and the rebellious spirit that defined him gives "The Fake Case" an unexpected and exciting feeling of momentum and, eventually, tension. The title is a bit of a double entendre. Ai’s company is named Fake Ltd.—a play on the F-word—but it also speaks to the charges against him. The government accused him of $2.5 million in tax evasion, but it’s clear that he’d long been a target for his outspoken and sometimes outrageous activities. He blogged daily and posted photos and video wherever he saw injustices. The key image in "Ai Weiwei: Never Sorry," which you really need to see before watching this, is of Ai holding up a middle finger in the direction of Tiananmen Square. "The Fake Case" follows Ai as he tries to reestablish himself as a conceptual artist, even as he acknowledges that he has become an even more important political figure than ever before. It doesn’t take long for him to start breaking his restrictions and talking to the press, something that worries his mother, who saw Ai’s own father similarly punished decades ago. "I think our family has always been living on the tip of a wave," she says quietly in one the film's more touching moments. "And Chinese society is like a huge wave." Ai also has his own young son, Ai Lao, to think about now, too. The toddler introduced in "Never Sorry," whom Ai had with a woman who wasn’t his wife, is now a constant fixture in his life—helping him in the garden at home, playing amid the 100 million porcelain sunflower seeds Ai scattered across the floor of London’s Tate Modern for an installation. Life and art have merged as one for him in a new way for a new generation. "If I don’t show my voice, if I don’t act as I always believe, then I’m dead already," Ai says very matter-of-factly in an interview with a foreign journalist. Johnsen intimately chronicles the fascinating push-pull of Ai’s daily existence: the man he truly is now contrasted with the man he hopes to become once again. Ai is still defiant enough to tail the men who’ve been assigned to tail him—and how often do you see a car chase in a documentary?—but he also suffers from nightmares and terrible sleep, nodding off in broad daylight on the patio while in the middle of a conversation. He seems to be in a constant fog even as he engages in the activities he loves—and yet, that fire clearly still burns within. 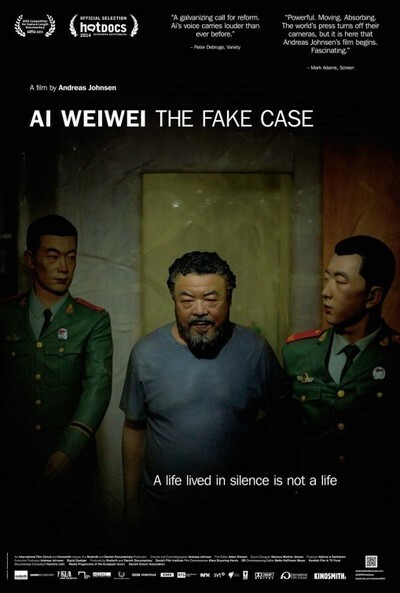 "Ai Weiwei: The Fake Case" recalls the same spirit that drove "This Is Not a Film," the inventive and deeply moving 2012 documentary Iranian director Jafar Panahi shot while under house arrest in his high-rise apartment. Both are about the urgent need to make art under constrained circumstances, and the creative lengths to which creative people will go to make their voices heard, no matter the cost.